Spring cleaning led me to a waffle maker that has interchangeable cooking plates that can be flipped to make a hot griddle. Since I work in the afternoon breakfast has been my moment to be creative for myself. I was reading the news and there was an article of Ricotta pancakes. I started to read some people's blogs and ricotta pancakes kept popping up. Destiny was calling. so I found a recipe I could tweek (like all chefs do) and made sure that the recipe had egg whites beaten. This makes the pancake a lot more airy and fluffy giving a light breakfast and energetic feel. I also added the chocolate chips to the batter to create a gooey cake. Drain Ricotta through a strainer. Whisk together flour, baking powder, sugar, and salt in a bowl. Whisk ricotta, milk, egg yolks, and vanilla in a separate bowl. Beat the egg whites in an electric mixer or by hand until stiff. Add the dry ingredients to the ricotta and milk mixture, stirring gently until just combined. Whisk in a small amount of the egg whites to lighten the batter, then fold in the remaining whites. Fold chocolate chips into batter. Heat a griddle over medium-high heat, and brush the surface with butter or spray with a nonstick coating. Pour batter onto the griddle to desired pancake size. Cook pancakes for about 3 to 4 minutes, then flip, cooking until both sides are golden brown. 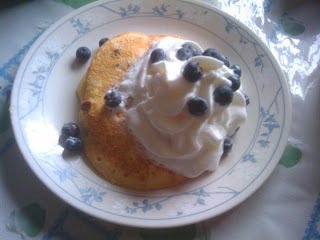 Top hotcakes with whipped cream and fresh berries. Eat. Be Merry.